American Socialist Triptych: The Literary-Political Work of Charlotte Perkins Gilman, Upton Sinclair, and W. E. B. Du Bois explores the contributions of three writers to the development of American socialism over a fifty–year period and asserts the vitality of socialism in modern American literature and culture. Drawing upon a wide range of texts including archival sources, Mark W. Van Wienen demonstrates the influence of reform-oriented, democratic socialism both in the careers of these writers and in U.S. politics between 1890 and 1940. While offering unprecedented in-depth analysis of modern American socialist literature, this book charts the path by which the supposedly impossible, dangerous ideals of a cooperative commonwealth were realized, in part, by the New Deal. American Socialist Triptych provides in-depth, innovative readings of the featured writers and their engagement with socialist thought and action. Upton Sinclair represents the movement's most visible manifestation, the Socialist Party of America, founded in 1901; Charlotte Perkins Gilman reflects the socialist elements in both feminism and 1890s reform movements, and W. E. B. Du Bois illuminates social democratic aspirations within the NAACP. Van Wienen's book seeks to re-energize studies of Sinclair by treating him as a serious cultural figure whose career peaked not in the early success of The Jungle but in his nearly successful 1934 run for the California governorship. It also demonstrates as never before the centrality of socialism throughout Gilman's and Du Bois's literary and political careers. More broadly, American Socialist Triptych challenges previous scholarship on American radical literature, which has focused almost exclusively on the 1930s and Communist writers. Van Wienen argues that radical democracy was not the phenomenon of a decade or of a single group but a sustained tradition dispersed within the culture, providing a useful genealogical explanation for how socialist ideas were actually implemented through the New Deal. 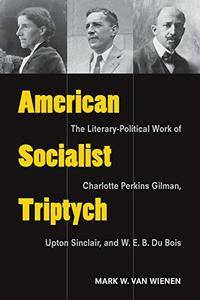 American Socialist Triptych also revises modern American literary history, arguing for the endurance of realist and utopian literary modes at the height of modernist literary experimentation and showing the importance of socialism not only to the three featured writers but also to their peers, including Edward Bellamy, Hamlin Garland, Jack London, Edna St. Vincent Millay, and Claude McKay. Further, by demonstrating the importance of social democratic thought to feminist and African American campaigns for equality, the book dialogues with recent theories of radical egalitarianism. 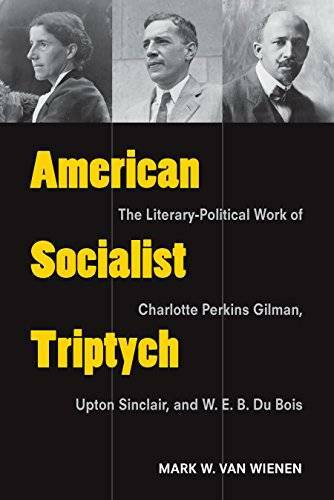 Readers interested in American literature, U.S. history, political theory, and race, gender, and class studies will all find in American Socialist Triptych a valuable and provocative resource.